“Presenting the further adventures of everybody’s favorite superhero, the man who is faster than lightning, stronger than steel, smarter than a speeding bullet… it’s Super Grover!” And he is cute too! I’ve loved Grover, and his super alter ego, since the first time I saw them on Sesame Street. How could anyone not love that little blue monster? He’s so cute! Measuring in at a fuzzy blue 14 inches, Grover was sculpted on an armature to ensure standability and allowing his arms to stretch forward when he takes flight. 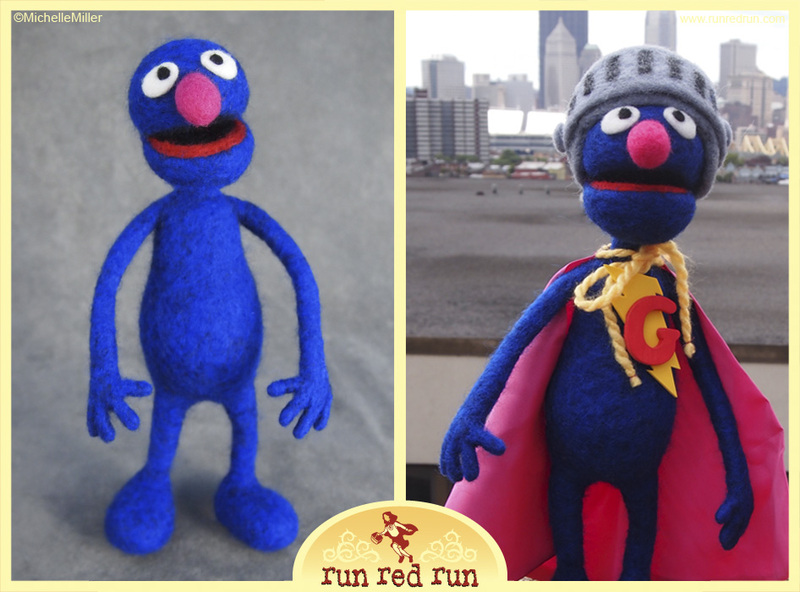 His felted helmet, fabric cape and super emblem are removable so Grover can turn back into his lovable monster self whenever he wants. See more photos in the gallery! Grover is my most favorite Sesame Street character. I love him and love how you captured his silly goofiness, Michelle. Fantastic! Thanks, Joseph! It’s really hard to pick a favorite Muppet. Grover is hard to beat and he’s so lovable! Thanks for the nice words about him, I’m so glad you like him!